In spite of the challenges we face in this day and age, we are also witnessing a move of God on a global scale that is without precedence. This book is the first in a series of books that will enable us to connect to this worldwide move of God at a local level. PROPHETIC DITCH DIGGING is all about preparing the ground to receive the promises and blessings of God for your sphere of influence. What others are saying about this book: BRIAN MILLS, Author, Senior Advisor to the International Prayer Council, England "Alistair Petrie is one of the foremost international Bible teachers of today. He homes in on subjects that have a prophetic cutting-edge towards transformation of communities. This book is good read if you are prepared to be challenged to do things differently in expressing the kingdom of God where you are." WILL SOHNCHEN, Lead Pastor, Evangel Church, Kelowna, Canada "This is a timely read. As with all of Alistair's books it is both theologically sound and extremely practical." MARGARET and ROBIN CLARKE, Directors, Transformations Ireland, Bangor, Northern Ireland "Prophetic Ditch Digging will, in a very practical and insightful way, equip and inspire those that are desiring and praying for breakthrough and shift in their families, churches and communities." 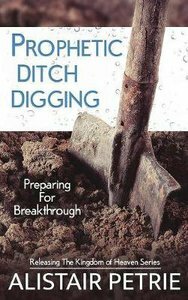 About "Prophetic Ditch Digging: Preparing For Breakthrough"
Alistair P. Petrie is the Director of Ministries Centinela in Canada and Director of operations of Ultramar for the Group Centinela. He coordinates the Connection Joshua in Canada and he is also a frequent speaker in conferences and seminaries. SPANISH BIO: Alistar P. Petrie es el director de Ministerios Centinela en Canada y Director de Operaciones de Ultramar para El Grupo Centinela. Un anglicano ordenado, coordina la Conexion Josue en Canada y es un frecuente orador en conferencias y seminarios.